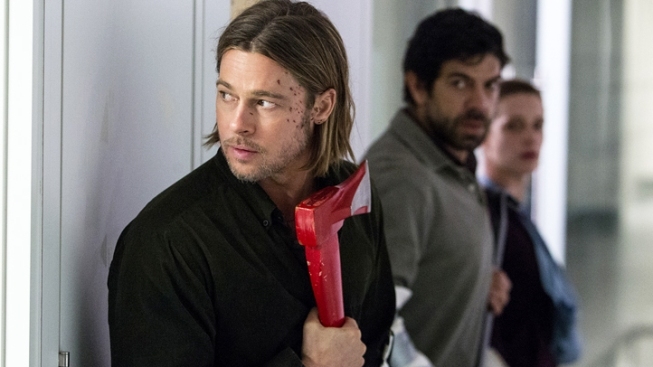 In the Brad Pitt thriller opening Friday, those infected with the zombie virus move slowly until they detect prey. Films such as "Dawn of the Dead" and "28 Days Later" have also shown more lithe living dead. Romero blamed the shift to swift-footed undead on video games. Looks like some (undead) body has been hitting the treadmill. The zombies in "World War Z" move with Carl Lewis speed and a swarm-like mentality inspired in part by rabid dogs, furthering the eternal fan debate over whether the walking dead should actually run. Traditionalists — fans of George Romero's 1968 horror classic "Night of the Living Dead" — prefer their zombies slow and lumbering. But modern incarnations of the undead are often more agile. "Some people think slow-moving zombies aren't that much of a threat, because they're pretty easy to maneuver against," said Roger Ma, author of "The Zombie Combat Manual: A Guide to Fighting the Living Dead." ''I'm more a fan of the slow-moving genre, and that's how I approach the strategy in my book. Fast-moving zombies present a whole new host of issues you have to deal with." "It makes sense if you think about it. Those games are all about hand-eye coordination and how quickly can you get them before they get you. So the zombies have to keep coming at you, crawling over the walls and across the ceiling," he told Vanity Fair in 2010. "I still don't agree with it. If zombies are dead, how can they move fast? My guys don't run. They never have and they never will. They're just lumbering oafs that are easy to dispose of unless you make a mistake. Those are the rules, and I'll stick with what I've got." In the Brad Pitt thriller opening Friday, those infected with the zombie virus move slowly until they detect prey. Inspired by images of attack dogs and feeding insects, filmmakers said they wanted to honor the zombie genre, but also "try to do something new and different." Director Marc Forster likens the movement of "World War Z" zombies to "the way flocks of birds or fish or ants move together." "I thought it would be interesting to see these zombies, who have no intellect since they are the walking dead, react in this swarm mentality," he said. "When the feeding frenzy starts, it's almost like a shark that smells blood. In the moment they sense that there's something to attack, they will just go for it." Pitt plays a former United Nations investigator searching for the source of the worldwide plague that turns people into athletically inclined zombies that can scale walls and overtake cities in minutes. Soldiers shoot down some of the zombies, but without a weapon, humans don't stand much of a fighting chance. "With fast-movers, you really lose the ability to strategize, both from an individual perspective and an agency, law enforcement or government perspective," said Ma, whose book deals with fighting zombies without guns. "You don't have time to think. That's the most challenging thing with the fast movers." But can devotees of traditional depictions of the undead appreciate the sportier zombies of today? "It's always great to see zombies," Ma said. "As a fan, we'll take whatever we can get. Fast moving, slow moving... as long as the story is good, there's a place for both."